After looking around in a few files I found that it's related to the custom settings and the util.h file. Still three error messages to go but I'll see if I can't fix those as well. EDIT: Changing HDR mode back from 2 to 0 in McFx_settings solved all of them, now to see if I can find what caused it to break. EDIT: Changing HDR mode in both McFx .cfg and GemFx .cfg solved it. Last Edit: 4 years 3 weeks ago by JBeckman. 1. Is there a way to toggle the enabling/disabling the whole framework via 1 key? 2. Regarding HUD masking, I can't seem to find how to enable it, I see an .png image in the common/textures named RFX_sMask.png but how to activate it? 2. 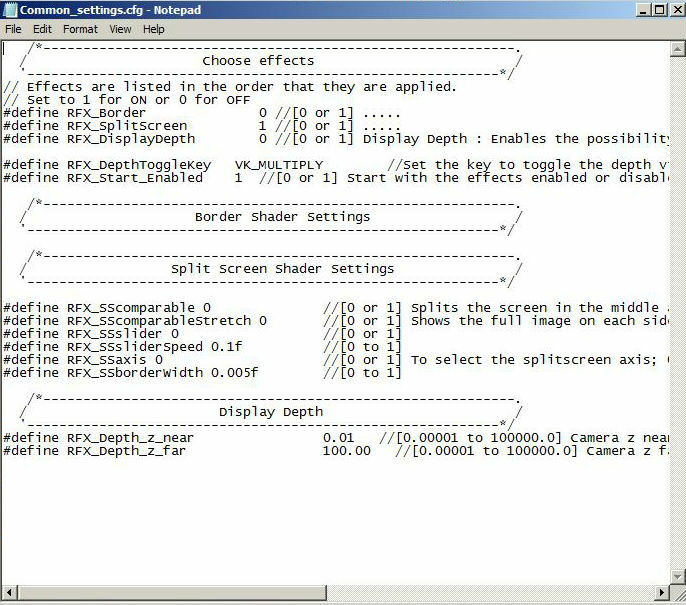 Splitscreen (in the Common_settings.cfg) without comparison or slider will use the mask. You can use it for the HUD. 3. According to Marty, the algorithm did not change with the last update. However, the dirt texture differs greatly, so you might want to try replacing the GFX_dirt.png in ReShade/GemFX/Textures with the mcdirt.png from ME (if you like it better). Thanks for the feedback. I already implemented all fixes and am currently waiting for the upload. (either I will upload it myself and crosire can later change the link or he will come online in a moment) Either way, the issues should be fixed. Also I added key toggles to all techniques so the key toggle defined in the Common_settings.cfg will now toggle all of them. I think the other stuff I noticed has been brought up already. I updated the op with a fixed version. The binaries will stay the same so there is no need in changing the version number (it is only a quick fix after all). Additional color correction shader from ME will follow in a following update as explained earlier. With ReinhardLinear and FilmicPass the -in my opinion- most important ones have been ported already to SweetFX. That warning (not error) is okay, it will not mess with anything. EDIT:: Okay I found it. Change " i%2 " to " i%2f "
Replacing the fixed file right now. The key toggle should work (I just checked). Did you try the scroll lock key as defined as default? Last Edit: 4 years 3 weeks ago by Ganossa. Yeah, Scroll lock, VK_Scroll, or 0x91. It worked for me with MFX, but still no. Last Edit: 4 years 3 weeks ago by BrandonHortman. I'll try it on Far Cry 4, I was currently using it on Dragon Age Inquisition. Maybe also try it with a non 64bit game, in case the issue is bound to those binaries. You might also try "VK_SCROLL" instead of "VK_Scroll" in case it is case sensitive. Ok, I tried case sensitive alternatives. I dont think I have any 32 bit games. Unless The Witcher 2 is 32 bit. I'll check that now. Fresh install on Witcher 2 with 32 bit DLLs resulted in no toggle key support also. I also tried using VK_TAB instead of VK_SCROLL with no results. Toggle key not working here too. Tried VK_RCONTROL and VK_RMENU and still nothing. Fresh install on Far Cry 4 also no toggle key support. Seems like it should work fine as far as I can tell. Also tested OpenGL32 on zDoom, no toggle. The framework has no key toggle currently, unless you add the code for it. So that's expected. Lucifer updated the file earlier. Fixed the HDR erros, HBAO warnings, and included the code for toggle keys. Its working for him, but not for us so far. The file is on the first page. And about 3. question, yeah I know about the LensDirt texture I used the same ones in the preview pictures, but when I opened MasterEffect 1.1.190 again, I saw there were some new values which were not present in your GemFX_settings.cfg, here are those new values. Your LensDirt seems to only have the fLensdirtIntensity while the MasterEffect has these 3 more, could this maybe be the problem? Last Edit: 4 years 3 weeks ago by fuze. You could try to do a folderwide search and replace of "< enabled = true; >" with "< enabled = true; toggle = 0x20; >" for the spacebar as toggle In the ReShade directory inside your game folder. The common_settings.cfg is working (split screen works fine from there) , and if I change the toggle key to something not defined in the Keycodes.h, like VK_scroll (a case sensitive fail) then I get an error from it. It doesn't toggle in any game I own though.